Step 1 Make sure to turn OFF the hot and cold water mains. Step 2 To remove the handle you must remove the grub screw with a suitable sized allen key. Be careful not to lose grub screw. Some Single Lever Taps have a coloured indicator on the front (blue / red) which conceals the grub screw. Remove this indicator carefully with something delicate e.g. 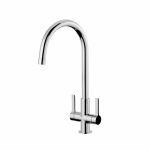 tip of knife, being careful not to scratch your tap to access grub screw behind. Step 3 Unscrew the silver dome shape. Step 4 Use an appropriate sized spanner to loosen the brass nut. Step 5 Remove defective cartridge. Step 6 Before putting in new cartridge check the inside of the tap body and remove any debris that might be there. Step 7 Replace and tighten brass nut. Step 8 Replace silver dome. Step 9 Refit the lever handle. Step 10 Refit the grub screw. Step 11 Turn on the water. I hope the information below will be of some help to you. 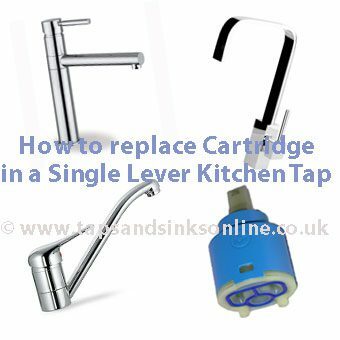 If you are in any doubt about CHANGING a Kitchen Tap Cartridge – do contact a professional plumber. 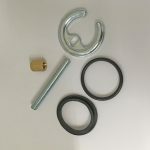 You can purchase Tap Spare Parts here. 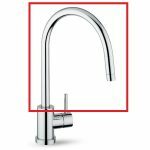 Question: I have a franke belfast pull out nozzle tap which is dripping from behind the lever handle. Is this a cartridge or O ring problem? Answer: This would usually indicate a valve or cartridge issue. 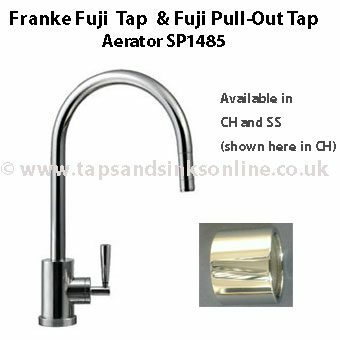 The following Guides will provide you with more information : Kitchen Tap Mixer Tap leaking from handle and also UK Kitchen Taps Troubleshooting Guide for further information / help.